Adventures with the Estrogen Army is an adventure incubator and collaborative resource hub for women over 40 who are hungry to create epic adventures on a shoestring budget. Our “Adventure Lab” will serve as a “dream catcher” where women can design and share their own adventures – from micro to epic – and discover others they may not have imagined yet. We will be stocking it with tools to make it easy to discover, plan and launch big-hearted adventures fit for the sassy adventure diva you are, in the company of sisters who have “been there, done that”. We’ll be sharing ideas, tools and resources to make it easier to give ourselves a hand up, and doing it in a way that doesn’t leave people out. Not everyone with big dreams has a big budget, and this project is about finding ways of making sure every adventure diva has a chance to make her bucket list a “been there … done that” list. With a focus on asset-building and mentoring, we deal with the whole person in a way that is inclusive, regardless of financial means, and that creates opportunities for women at risk both in our local communities, and in developing nations. 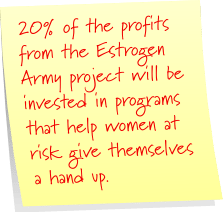 In fact I’m so committed to ensuring that women from every walk of life have a fair shot that I’ll be investing 20% of the profits from the “Adventures with the Estrogen Army” project into non-profit programs that help women at risk give themselves a hand-up. Have fun. Do good. Not a bad way to embrace act 2 in our lives, huh? Want to help build the Adventure Lab? “Like” the page and be sure to click on “Get notifications” beneath the Like tab to ensure you’ll know when we share something new there. What’s YOUR adventure? I can’t wait to find out!